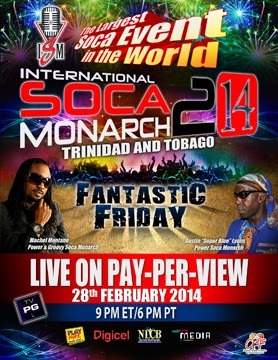 Thank you to CarnivalTV (broadcasters of last year's Soca Monarch) for the link to this year's competition. We can all experience the Pay-Per-View event for $19.95USD and the stream appears available for all internet devices including iOS and Android. *We have been given 2 links to PPV. Here is the Order of Performances for the Groovy Category on #ISM2014 Fantastic Friday! Here is the Order of Performances for the Power Category on #ISM2014 Fantastic Friday!